Complex Congenital Neglected Deformity of Hallux Varus with Polydactyly and Syndactyly with its Management. Orthopaedic Department, Noble Hospital, Hadapsar, Pune- 411013, Maharashtra, India. Orthopaedic Department, Shri Prayagdham Trust Charitable Hospital, UruliKanchan, Pune- 412202, Maharashtra, India. Orthopaedic Department, SmtKashibaiNavale Medical College and General Hospital, S. No 49/1, Westerly Bypass Road, Narhe (Ambegaon), Pune – 411 041, Maharashtra. India. Introduction: Congenital hallux varus of secondary type is associated with polydactyly, syndactyly or other congenital deformities of the foot. Such congenital deformities can be addressed in childhood with soft tissue reconstructive procedures. In adulthood, treatment of these deformities is challenging because of soft tissue contractures and rigid bony deformities. To our knowledge, this is the first case report demonstrating the management of neglected secondary congenital hallux varus in adults. Case Report: We present here a case of a 23 years old male patient who presented to us with untreated congenital hallux varus of secondary type. Patient had an extra great toe (polydactyly) with syndactyly. We have treated this patient in two stages. First stage consisted of excision of the extra great toe and gradual correction of medial great toe. 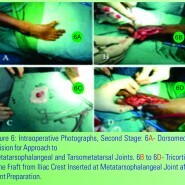 In second stage, metatarsophalangeal joint fusion was done. We have follow up of this case for more than 2.5 years. Conclusion: Severe neglected congenital deformities presenting in adulthood pose unique problems of soft tissue contractures and permanent bony deformities. Congenital neglected hallux varus with polydactyly and syndactyly is a rare deformity. Its correction was challenging as patient presented to us in adulthood. A staged approach of gradual soft tissue distraction and then metatarsophalangeal joint fusion has resulted in satisfactory aesthetic and functional outcome. Keywords: Polydactyly with syndactyly, neglected hallux varus, secondary congenital hallux varus, metatarsophalangeal joint fusion, distraction with external fixator.